of street-level space at the 100 block of Central Avenue, adjoining The James Museum of Western & Wildlife Art. Opening Spring 2018, Datz DTSP will be the first Datz to open outside of its flagship location in South Tampa. “We are so excited to bring Datz to St. Petersburg! It’s causing some real excitement amongst those in the know, and rightfully so. We think we are a great match with a booming city that loves art, originality and edgy cuisine,” says Datz founder Suzanne Perry. Along with the popular restaurant, Sembler has also confirmed a lease with Woodhouse Day Spa to occupy 5,985 square feet, as part of The James Museum Building on 1st Avenue South. Woodhouse will be locally owned and operated by Mark and Ginger Lettelleir and offer a full range of spa and wellness experiences. Woodhouse is expected to open in the spring. More information can be found at www.woodhousespas.com. “Mark and I are honored to be part of the Woodhouse Franchise community, and are very excited to bring this upscale, holistic day spa to St.Pete…the city that we both love so much,” says Ginger Lettelleir. Approximately 5,700 square feet of ground-floor retail space is still available adjoining The James Museum. For more information contact Sembler at (727) 384-6000. The James Museum will be the new, permanent home of approximately 400 premier works of art selected from the more than 3,000 pieces acquired by Tom and Mary James over their 50 years of collecting. 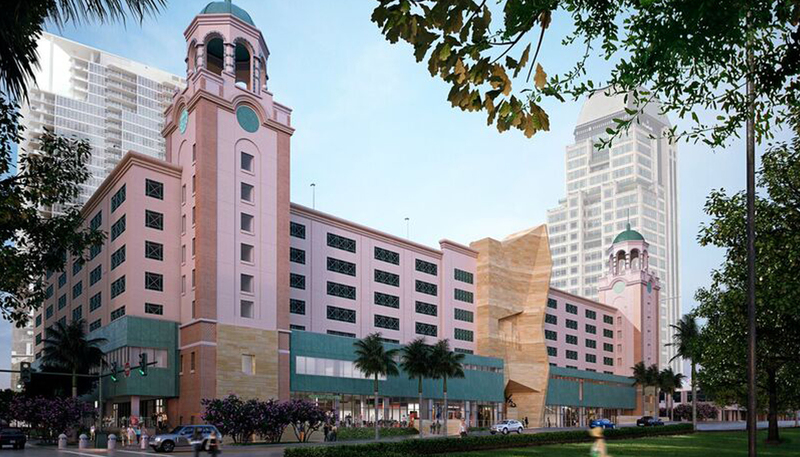 The 88,000 square foot museum at 150 Central Avenue in St. Petersburg will include over 30,000 square feet of gallery space; a double-height lobby with water feature; Native American Jewelry collection, 6,000 square feet of rental event space, supporting both large events and break out sessions; a commercial catering kitchen; a museum store and café; as well as all of the spaces required to support and operate a 2st century museum of this scale. Planned programming includes special exhibitions in a variety of genres, artist talks and demonstrations, art classes, docent tours and children’s activities. In addition to the museum space, the development of The James Museum building will include almost 35,000 square feet of leasable space, owned by James R.E., situated on the East and West sides of the project. The Sembler Company is leasing the ground floor retail units and Echelon Real Estate Services is leasing the Class A Office space located on the second floor. Construction of the museum is scheduled to be completed by the end of 2017, with a grand opening planned for early 2018.